Despite its fancy appearance and illustrative name, the red onion is a cultivar, a sort of more colorful variety of the common onion (Allium cepa). Botanically speaking, the red and common onion are not so different from one another. However, from a nutritional point of view, the distinct traits of red onions that make them so popular indicate specific nutrients with different properties and health effects than those found in common onions. Red onions, for example, contain a type of natural pigment called cyanidin, a type of anthocyanidin also found in red cabbage, black raspberries or blackcurrants. This purplish pigment has been found to possess antioxidant and anticancer properties and contribute to diabetes, obesity and cardiovascular disease prevention. Red onions also boast similar health effects to common onions such as antibacterial, anti-inflammatory and anti-proliferative properties. What do red onions look like? As expected, red onions look a lot like regular onions, except for their purplish color. While the outer skin is completely purple, the flesh of most red onion varieties is white with purplish tinges. 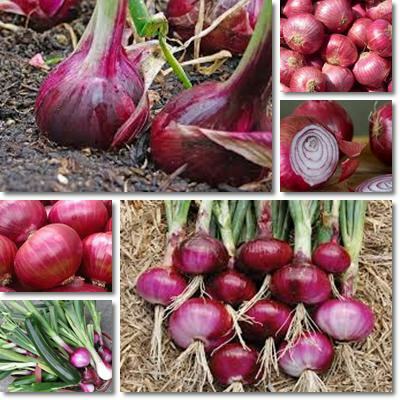 Though they can be picked young, they are preferably harvested at maturity and thus most red onions made available have a medium to large size. What do red onions taste like? Red onions taste a lot like regular yellow onions, with both a pungent and slightly sweet flavor. Some varieties with either a sweeter or a more pungent taste are being grown to suit all taste buds of onion lovers. The red onion of Turda, a city in Cluj district in Romania, is especially grown for its sweeter flavor. The red onion of Tropea, a city in Italy, is grown for its particularly intense flavor and whiter flesh. Unlike common onions, the red variety has slightly less meaty layers and a not very tender texture. Cooking red onions for long periods of time can cause them to lose their color (and important nutrients along with it), though it makes them easier on the stomach. 100 g of red onions contains only 40 kcal as well as good amounts of vitamins C, B6 and B9 and small amounts of manganese, phosphorus, magnesium and potassium. 1) Anticancer properties. Onion consumption has been linked with a reduced risk of various cancer forms, notably stomach, liver and colon cancers. Red onions in particular contain sulfur compounds and important flavonoids such as quercetin and the anthocyanin cyanidin, all natural compounds with antioxidant, free radical scavenging and anti-proliferative properties. Organosulfur compounds (or sulfur compounds) give red onions and the rest of the onion family and garlic their distinct pungent flavor. Studies on their properties and health benefits reveal they may effectively help prevent various forms of cancer. Sulfur compounds appear to offer protection against the disease by inhibiting the formation of substances causing cancer, promoting DNA repair, preventing cancer cell proliferation and inducing apoptosis (programmed cell death) in cancer cells. Flavonoids in general have been linked to a reduced risk of developing cancer as well as other chronic illnesses such as heart disease, diabetes or obesity. And red onions contain two such powerful constituents: quercetin and the red-purple pigment cyanidin. Quercetin and cyanidin are both found in apples, wine, berries and red onions. In addition to other important health benefits, quercetin, for example, has been found to be toxic for cancer cells because it prevents their spread and induces apoptosis (programmed cell death) in malignant cells (Quercetin and Cancer Chemoprevention, 2011). 2) Rich in antioxidants. The deep purplish color of red onions is indicative of a high concentration of antioxidants in the form of flavonoids, quercetin and the anthocyanin cyanidin being the most noteworthy of our attention. Having a diet rich in fresh fruits and vegetables abundant in flavonoids is believed to keep the body healthy and prevent chronic illnesses such as cancer, cardiovascular disease, diabetes and obesity, all potential results of bad diets. 3) Anti-inflammatory action. The naturally occurring organic sulfur compounds in red onions not only give them a pungent taste, but also exert quite a strong anti-inflammatory activity. Sulfur compounds along with good amounts of vitamin C, another excellent natural anti-inflammatory, contribute to the wonderful health effects of red onions. According to research, having high inflammation markers in the body creates a predisposition for chronic illnesses such as cancer, diabetes, heart disease and so on, hence the importance of including anti-inflammatory foods in our diet. 4) Antibacterial and antiviral properties. Red onions support the immune system thanks to various compounds such as vitamin C, a powerful natural antibacterial and antiviral compound, organic sulfur compounds as well as other natural constituents, as reflected by various laboratory and animal studies (Effect of Allium Cepa and Allium Sativum on Some Immunological Cells in Rats). Nevertheless, cooking heat destroys some of the beneficial components in red onions, notably vitamin C, hence the need to consume the vegetable raw. 5) Boast cardiovascular benefits. The members of the onion family have been shown to help reduce blood cholesterol and triglyceride levels (blood fats) as well as exhibit anti-platelet activity, meaning they can prevent blood clots that can lead to heart attacks or strokes (Onions- Phytochemical and Health Properties). Nevertheless, the onions must be consumed raw as cooking heat destroy the sensitive compounds responsible for such health benefits. 6) Can help increase bone density and reduce osteoporosis risks. 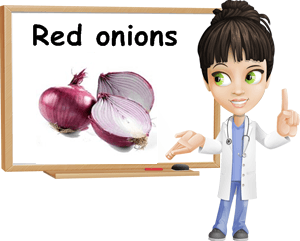 Just like the common onion, red onions may contribute to osteoporosis prevention and bone health as a result of their ability to increase bone density. Nevertheless, without a proper diet supplying the actual nutrients required for bone formations (such as calcium, magnesium or phosphorus), their effect is insignificant. 7) Antiasthmatic effects. Some studies suggest that all onion varieties, red onions included, may exert antiasthmatic effects. These effects are believed to be a result of thiosulfinate compounds which are released when onions are cut, bruised, chewed or damaged in any way. These sulfur compounds can alter the metabolism of arachidonic acid, a polyunsaturated Omega- fatty acid which can be turned into inflammatory compounds within our body. Other health benefits of red onions include anti-diabetic properties and obesity prevention and are a result of specific compounds such as the antioxidant flavonoid and anthocyanidin called cyanidin, quercetin, sulfur compounds, etc. Nevertheless, as healthy as all onion family members may be, not anyone can eat them. Just like all onions, red onions may cause significant gastrointestinal discomfort in many people. Symptoms such as bloating, burping, stomach discomfort, acid reflux, heartburn and so on may occur. Some people are even allergic to them. If this is the case for you too, it might be best to substitute onions with other similarly nutritious foods your body tolerates well.